Around THE YEAR 450 before J. C, Massalia had built a city not so far from the Cap-d’Antibes, almost at the same place where the old town of Antibes is locate today. ANTIPOLIS ( the town on the other side of Corsica or the town in front of Corsica). ANTIPOLIS became very quickly Famous all around the Mediterranean sea. Its harbour was rich and prosperous. Ever since the 7° century, the Celtic migration had been slowly advancing south. Iron, which in the beginning had been considered as a precious metal, quickly became something common and was use to make dangerous weapons. The most famous of all Celtics chef was Brennus who besieged Rome in 387 before J.C. (VAE VICTIS), but was then beaten by CAMILLE. Although the Celts had lost all hope pf getting settle in the north of Italy, they still occupied the south of Gaul and in the beginning kept up good relationship with the Greek. 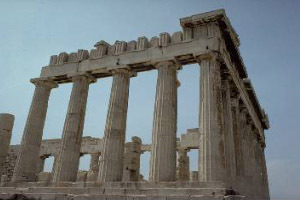 The wealth of Greek cities was such that they wanted to take possession of them. Massalia called Rome for Help. Rome had already protected Antipolis once in 154 before J. C. against the Oxybians and the Deceates and have given Antipolis the right of self-governing. Greek temple in the V° century before Christ (photo Pierre). 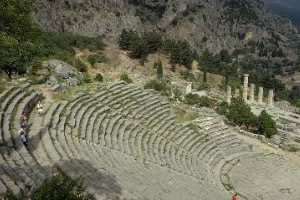 Greek Amphitheater at “Delphos” (photo Pierre). The Celtics (Brennos and Kerethrios) ravaged Greek country in 279 before Christ, but the sanctuary of Apollo was safe. Then Rome had to intervene a second time against the Celts : the Salyans ( Belgians). With Rome’s victory (north of Aix-En-Provence) in 125 before J. C. began the conquest of the south of Gaul. Massalia and Antipolis got very rich under its protection “ PROVINCIA ROMANA : Provence was founded. The Proconsul of the province of Narbonne : CAIUS JULIUS CAESAR (defeat of Vercingetorix, former chief of Caesar’s Gaulic cavalry) revolt against Rome (aleas jacta est : the dice are thrown) whose legal representative was Pompey. While Massalia supported Pompey, Antipolis formed an alliance with Caesar in the year 50 before J. C.
The Proconsul of the Narbonnaise District who conquered the Gaulle (after the deafest of Vercingetorix, ex general of gallic knights of Caesar) Caius Julius Caesar fight against Pompee who was the Consul of Rome (aleas jacta est). If Massalia joined Pompee case, Antipolis joined the case Caesar, in 50 before Christ.